Alfonso_Cuarón - TerritorioScuola Enhanced Wiki Alfa - Enhanced Search with WikiPedia Using Robots to display related resources from the web to all WikiPedia words (Video/Audio, .doc, ,pdf, .ppt, maps, edu, .html). "Cuarón" redirects here. For other people with the surname, see Cuarón (surname). Alfonso Cuarón Orozco (US: /kwɑːˈroʊn/; Spanish: [alˈfonso kwaˈɾon] pronunciation (help·info); born 28 November 1961) is a Mexican film director, screenwriter, producer, cinematographer, and editor. His work has received critical acclaim and many accolades. He has been nominated for 10 Academy Awards and won five, including two Best Director awards for Gravity (2013) and Roma (2018). He is the first Latin American director to receive the award for Best Director. He has also received Academy Awards for Best Film Editing for Gravity and Best Cinematography for Roma. Cuarón's other notable films include the family drama A Little Princess (1995), the drama Y Tu Mamá También (2001), the fantasy film Harry Potter and the Prisoner of Azkaban (2004), and the dystopian thriller Children of Men (2006). He has publicly shown his fascination for the Esperanto language and his support for the Esperanto movement. In fact, he called his production company Esperanto Filmoj. ^ "Say How: C". National Library Service for the Blind and Physically Handicapped. Retrieved 17 October 2018. ^ Valdes, Marcela (13 December 2018). "After 'Gravity,' Alfonso Cuarón Had His Pick of Directing Blockbusters. Instead, He Went Home to Make 'Roma.'". The New York Times. Retrieved 26 February 2019. ^ J.K. Rowling Archived 4 February 2007 at the Wayback Machine Accessed 17 January 2007. ^ "Harry Potter and the Prisoner of Azkaban". ^ Interview by Sam Green with Cuarón. ^ Asansouthwestohio (23 September 2009). "Autistic Self Advocacy Network, SW Ohio: Autistic Community Condemns Autism Speaks". ^ "Movie News: Movie Reviews, Trailers, Photos - EW.com". ^ Venice Film Festival 2013: Sandra Bullock stuns in a scarlet dress with George Clooney | Mail Online. Dailymail.co.uk. Retrieved on 2014-05-22. 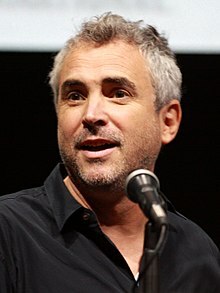 ^ "Who Is Roma Director Alfonso Cuarón? You've Definitely Seen His Incredible Movies". Harper's Bazaar. 23 February 2019. Retrieved 25 February 2019. ^ a b "Academy Awards Search". Academy of Motion Picture Arts and Sciences. Retrieved 25 February 2019. ^ "The 100 Most Influential People – Pioneers: Alfonso Cuarón". TIME.com. 23 April 2014. Retrieved 26 April 2014. ^ Kroll, Justin (8 September 2016). "Alfonso Cuaron Sets Mexican Family Drama as Next Film". Variety. ^ Dan P. Lee (22 September 2013). "The Camera's Cusp: Alfonso Cuarón Takes Filmmaking to a New Extreme With Gravity". Vulture.com. Pietrasanta, Italy: New York. Retrieved 12 July 2015. ^ "Vogue Arts – Down to Earth". Loquet London. 12 December 2013. Archived from the original on 12 December 2013. Retrieved 26 July 2015. ^ Baftas 2014: Alfonso Cuarón wins best director for Gravity | Film. theguardian.com. Retrieved on 2014-05-22. ^ a b "Anuncia Cuarón separación matrimonial de su segunda esposa". La Crónica (in Spanish). NOTIMEX. 23 June 2008. Archived from the original on 21 December 2018. Retrieved 21 December 2018. ^ "Black Sun". British Council. 1 June 2009. Retrieved 25 February 2019. ^ "'This Changes Everything' Trailer: Climate Change Docu Based On Naomi Klein's Bestseller Set For Toronto Premiere". Deadline Hollywood. 26 August 2015. Retrieved 30 August 2015. ^ JAGERNAUTH, KEVIN. "'Gravity' Companion Short Film 'Aningaaq' By Jonas Cuaron Will Be Released As A DVD Extra". indiewire.com. Archived from the original on 9 October 2013. ^ "Awards Database". British Academy of Film and Television Arts. Retrieved 26 February 2019. ^ "Search". Hollywood Foreign Press Association. Retrieved 26 February 2019.